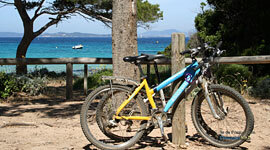 Discover Provence cycling is to take the time to browse through hills and green valleys freely. It is through the small villages of Provence charming and stop at random from a sublime panorama or a terrace. The bravest will attempt the ascent of Mont Ventoux in Vaucluse, less soft pressed will cycle in Luberon. A new way to discover the Luberon and the Alpilles by renting, per day or stay, its 200 electric bikes spread over the villages of Bonnieux, St-Rémy de Provence, Vaison la Romaine and Chateauneuf du Pape. The carefully chosen itineraries facilitate the discovery of many sights and attractions punctuating this territory through trails and bike paths rather than main roads. - Electric bike rental with GPS treasure trail according to your level and your availability with road book from 2 hours to 3 days cycling. - Cultural and foodie guided bike tours to visit Avignon's greatest places.